This is the only place I go for Computer advice. I have been building my own for quite some time, but I have a question for the collective. We use an All in One computer at the office, that does no more than email, excel, basically mundane tasks. Ours is starting to slow down, and I have run every cleaner that I know works well, so its time to upgrade. It is probably 6yrs old. Its a Gateway, no problems so far. There are so many different processors that it is mind boggling. Do you guys have a brand that you know works well. I really don't want Dell, I have had bad luck with them. I wanted to stay Windows 7, but it only comes with the cheaper versions. I might buy a copy, and just put it on whatever comp. I get. I am looking at this, but would like recs. It has what I want, and it should have enough horsepower. You have not described your 6yrs old computer. It would be great to know what you're using. I have seen 6yrs old computers gaining a whole new life just by the introduction of a SSD as the system disc. Just my two cents. If you're not happy then put the SSD in the next PC...or a laptop. That lenovo is nice, BUT, I would get a model with a 512GB SSD and forget the old fashioned hard drive. Cant remember the specs on the old one. I cannot find an all in one with SSD. Are you guys saying it would be easier to use an external? I have an AIO with a Samsung 850 EVO SSD in it. A nuc+monitor is also a jolly good idea. Easier to repair/replace malfunctioning parts and often cheaper up front AND down the road. Mount it behind the monitor if you prefer and it'd still be a zero-form-factor like an all-in-one. 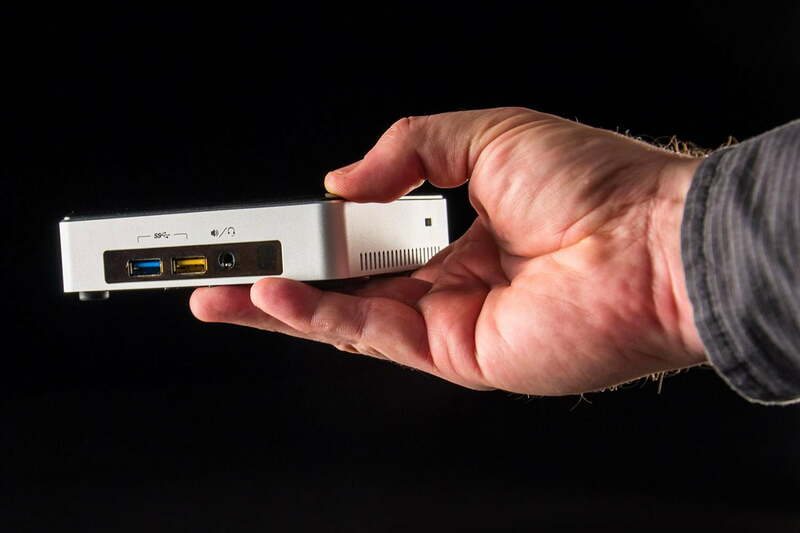 Here's a picture of a "NUC" mini-PC attached to the back of a monitor. The idea is to keep the old PC, but replacing the old HD with the new SSD. A Samsung 850 EVO 512GB would be a fantastic upgrade, but for basic use even the 256GB model could do the job. An external HD just to store data (documents) would be great too. All the more reason for us to know the specs of the old machine. The experts here will know if it's worth upgrading or replacing. Another good question... what jobs does it feel slow in? Graphics in a visual-heavy application? Slow video on youtube? Taking a long time to process a big spreadsheet? Or just loading Windows and all your other software? Its at work..I will look tomorrow. It might even be older than 6yrs. I could be wrong but I want to say it was an atom processor. It is getting slow at most tasks. I don't remember seeing any AIO computers with Atom back then. All the Atom-based computers I saw were netbooks. If the computer used to feel snappy, then it definitely was not Atom-based. An atom is slow no matter what you do. And Windows, with all the updates and fixes over the years, will get slower as time goes by. I like the Lenovo you linked. And going from Windows 7 to Windows 10 won't be a big deal. Just format, reinstall .. and while you're at it get an SSD first and put everything on that. If it was good enough yesterday chances are it good enough today. And goto the hosts file and put ******* etc on the loopback. Sounds like an Atom at worst, Core2Duo at best. Replacement is the best bet because even watching HD video and crunching Excel worksheets can get pretty laggy on those. Newer chipset & technologies all 'round as well. I still vote the NUC + monitor route unless you're worried about someone taking it home! (Unless it's yours and YOU can take it home!) If it's got sensitive information you can lock it in a drawer or small safe easier than a whole computer. Your call, of course... benefit of the Lenovo all-in-one is it comes out of the box ready to run. Of course, if you're getting an IT guy to transfer the info/apps from your old machine to the new one, it's no biggie to have him install the parts AND data to a new, empty NUC mini-machine. So what do you mean by that hosts file ? and what are the details on what you should put in it ? If your employer is paying for it the 27" iMac with the Fusion drive is the best AIO you can get. Seconded. The iMacs are really nice. It said Pentium Dual core T4400. It seemed to be running ok today, but I think when it has a backup to do, everything else is slow til it is done. We have it on a backup system. I am the employer, so I would prefer to save that money, no need for anything special to use just for business purposes. Is the backup over the lan, or to another physical drive? If it's too a drive, how is that drive connected? If lan, that could point to a network problem (your computer will get slow if it's saturating it's network connection). If to a USB connection, same result as the lan (the bus is saturated, slowing the computer). If it's another internal drive, an SSD would be helpful. What is your backup schedule like? Maybe just switch it to run at night. That's when mine run (at home). I might just unattach to see the difference. How long does that backup take? All-in-one machines are pretty poor choices for a lot of that stuff... even a small ITX cube beside the monitor would allow much, much more flexibility for this kind of stuff.